Are you going to miss Bake Off? I’m going to miss Bake Off. 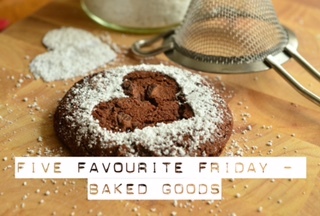 This weeks topic is baked goods, in honour of Bake Off ending! 5. Bakewell Tart. Even if I do remove the cherry off the top… Don’t ask. 4. Meringue. It’s very hard to be more specific on this one. I absolutely adore meringue. 3. Ciabatta. I love bread in general but ciabatta is good for use with everything – especially garlic bread…. 2. Pork Pies. Who doesn’t love a pork pie? 1. Macaroons. Little tiny bites of pure heaven. If you’ve never tried one, go and try one this weekend. You won’t regret it I promise! And that’s my top 5 baked goods!! What’s on your list? And don’t forget to head over to Broken Thoughts for Tim’s top 5! Previous Post My Bucket List: Places + Win a VIP weekend in Paris!! !